Today I was very surprised and happy to receive my first gift of a lei, the traditional garland of Hawaii made of flowers, leaves, and/or seeds. It was carefully draped over my shoulders by my friend Billie as a very touching thank-you and welcome gift before I gave an artist talk to her Art Theory class. An incredible fragrance immediately rose around me. After the class, I learned that it is custom, at least at the University of Hawaii at Manoa, to thank visiting speakers with a lei. At home, I read more about lei tradition, a very rich subject. 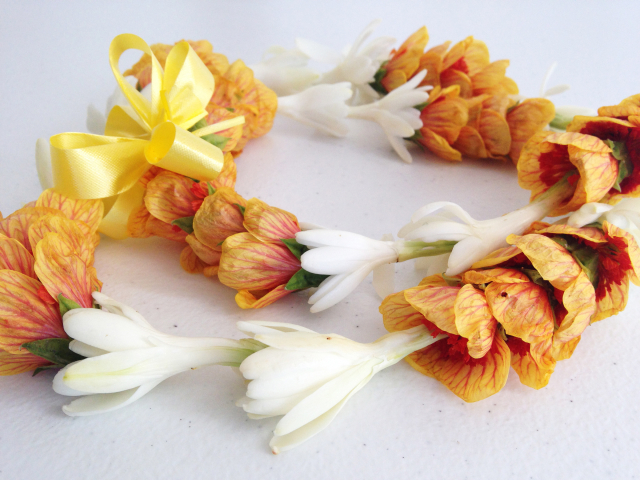 Lei are considered a symbol of love and respect, and must be treated with respect, in return, and there are many traditions on how to do that. I found it interesting that faded flower lei are never thrown in the trash, but returned to the earth — either cast into the sea or strewn back over the land. They can also be dried and saved as a memento. I also found it interesting that lei can actually be given on many different occasions, not just at graduation or when welcoming visitors (the two events at which I’d encountered this Hawaii tradition, in California and in Taiwan). 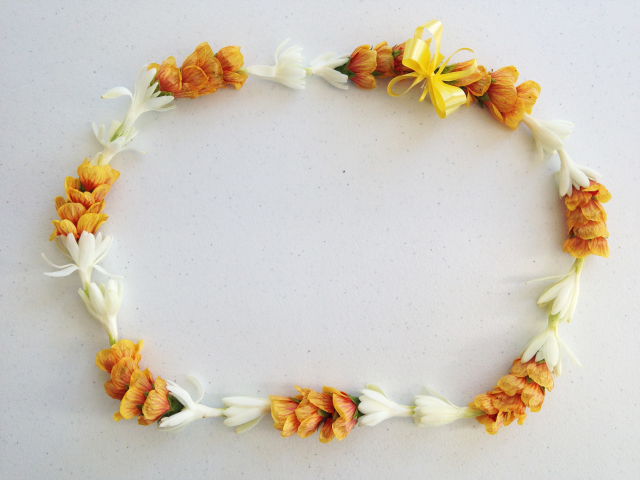 Everything from birthdays to business or political celebrations are celebrated with lei here. As someone who loves plants and is always curious about how people use and relate to them, I am looking forward to learning more about the tradition of lei making and giving. One thing I would like to know is what the small orange flowers, interspersed between the fragrant white tuberose, are called. Any ideas? This entry was posted in Blog and tagged hawaii, honolulu, local, local time. Bookmark the permalink.